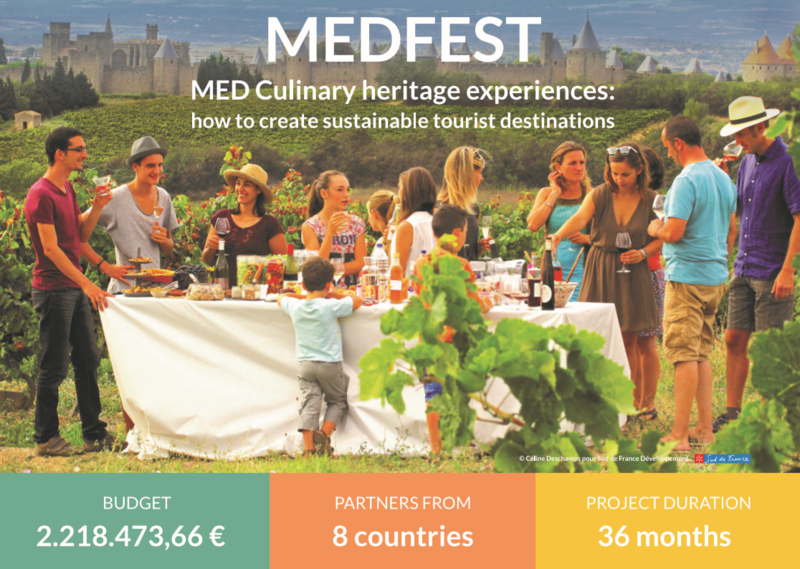 MEDFEST is tackling the challenge of diversifying traditional 'sun & sea' tourist destinations, with new and sustainable products based on rich and renowned culinary heritage of the Mediterranean. In so doing, increasing the sustainability and quality of life in MED space. MED space abounds with long and diverse culinary traditions that embody the rich cultural heritage of the area. This is evident by the addition of the Mediterranean diet to the UNESCO Representative List of Intangible Cultural Heritage in 2013. 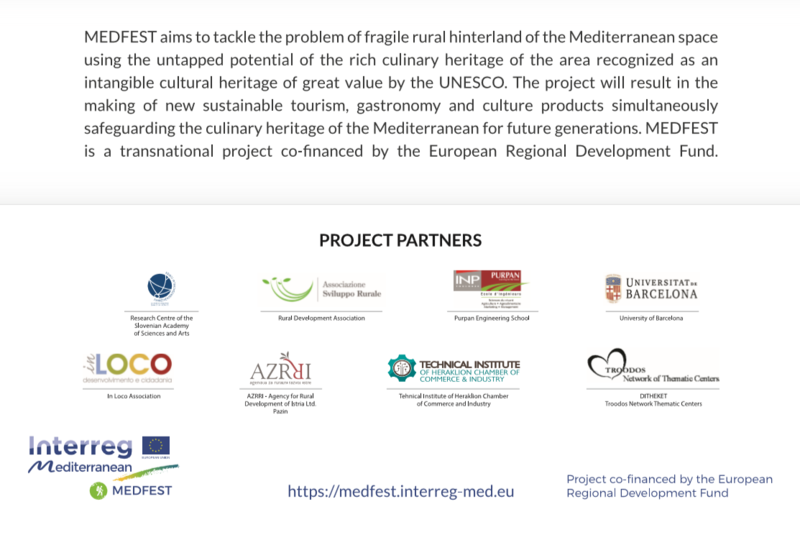 MEDFEST will make use of the former by creating new sustainable tourist destinations involving around the culinary heritage of the Mediterranean, in addition to enhancing community prosperity and improving the quality of life in rural areas. 3. safeguard culinary heritage for future generations. - common transnational strategy on managing and planning culinary tourism in MED space. Accessible Angels is a competence based service acquired through a VET curriculum enhanced by the incorporation of the social values of volunteerism, active citizenship and inclusiveness. Its quality is further assured by Vocational Competence Certificate (VCC) to certify the VET trainers participating in the planned training activity. The VCC training system creates new job opportunities for those who collect evidence of their qualifications within the VCC vocational development system. Its aim is to meet employers' needs and expectations about potential job candidates and effective employment by developing training paths and VCC certification process. Due to rapid changes in the labour market, continuing education and training (CVET) gives each individual the possibility to gain new skills and competences (of any type) to increase chances on labour market. The inclusiveness of the disabled requires a change of attitude which can only emerge through education. AccessAngels fosters inclusive travel for the disabled through the contribution of youth. It offers youth a certified by VCC skill to service their disadvantaged fellow Europeans, a vivid act of active citizenship. Europe is picking up its pieces from a severe economic and financial crisis. Unemployment rates reached 21.4% in 2014 (Eurostat) among young people. It is evident that Europe has to become smarter, more sustainable and more inclusive. More flexible, high quality education and training systems are required. A relatively high percentage of the age group of 18-24 continues to leave education and training to remain unqualified. Under these circumstances, Europe’s 2020 vision for VET, calls for a more attractive, relevant, innovative, accessible, and flexible educational system, to contribute to the excellence and equity in lifelong learning. There is an urgency to improve the ability of VET to respond to the changing requirements of the labour market. Undoubtedly, there should be close cooperation between the relevant stakeholders to review occupational and education/training strategies. This project is in line with the Europe 2020 strategy and its vision for an innovative and flexible involvement of VET in the real economy. The innovation emerges from the engagement of only disadvantaged groups to support sustainable development. Accessible people and unemployed youth living in remote rural areas come under the umbrella of sustainable tourism to support each other. Accessible tourism, a considerably sizeable market (estimated at about 740 million trips per year (EU report “EC Study: Economic Impact and Travel Patterns of Accessible Tourism in Europe”, 2014)), is in general absent from any sustainable tourism strategy. It requires mature social conditions to flourish and rural Europe is far from offering them. As the “Mapping and Performance Check of the Supply of Accessible Tourism Services (220/PP/ENT/PPA/12/6491) (2015) report indicates, Europe lacks the social superiority to appreciate the benefits of the accessible tourism market. The least used service offered to people with special needs was “Personal Assistance Services (PAS)”, only 70 services (out of the 146,760 identified) were described as PAS (0.05%). The exercise becomes an even harder task when Europe attempts to connect this type of tourism with sustainable development. To remedy the situation, the engagement of all stakeholders is absolutely necessary. AccessAngels utilises the qualities of VET to consolidate all powers (stakeholders, local authorities, relevant civil society organisations, and education/training providers) to support sustainable tourism. PAS are currently offered in some accessible cities but for a high premium. According to the “Economic Impact and Travel Patterns of Accessible Tourism in Europe” report (DG ENTR, 2012-2013), the lack of escorting is often considered a barrier to accessible travel. On average, a person with special needs, requires 1.9 escorts to travel, a substantial financial burden. The project „The use of modern technology to support the organic sector in Europe” aims is to develop oenological education in Poland, according to the latest international standards and the idea of permaculture, through the development of comprehensive oenological Knowledge Base. As part of the Knowledge Base will be prepared the course of vocational education and training for future oenologists, wine-growers and winemakers. Knowledge Base will contain substantive materials in the form of, among other things: 3 modules on the vines, the vineyard and vinification, and a manual for the analysis of weather events in the vineyard with the mobile application and models of disease. The learning process will promote modern tools (application supporting the process of learning, movies, animations), using educational techniques (like mnemonics). Activities will be covered by representatives of the wine-making sector, who want to improve their professional skills. A new European partnership project aiming to develop entrepreneurship in the wine industry. UseWine” focuses on the application of the TBL principles as a sustainability vehicle for the Wine SMEs in the rural areas. It will develop SME and stakeholder leaders who will have the competencies to promote and implement this business model. TBL is a business framework that incorporates three dimensions of performance: social, environmental and financial. This differs from traditional reporting frameworks as it includes ecological and social measures, which can be difficult to assign appropriate means of measurement. The TBL dimensions are also commonly called the 3Ps: people, planet and profits. It is a tested model that requires leadership skills to be successfully implemented. Truly effective leaders are distinguished by a high degree of emotional intelligence, which includes self-awareness, self-regulation, motivation, empathy, and social skill. They are required to have determination, vision and the ability to communicate and influence others. TBL leaders believe that taking care of profits, people, and the planet are critical to corporate success, for the business viability and long term sustainability. Studies indicate that the three most critical individual leadership competencies necessary for adopting the TBL approach are long-term vision, effective communication, and powerful influence.